My posts recently have shown a growing concern for the loss of religious freedom in America. Unfortunately, the trend away from liberty is global. Since 2008, the number of countries with severe restrictions on religious liberty has increased by 23 percent, according to the extensive new study recently released by the Pew Forum on Religion and Public Life. treasure trove of bad news for worshiping people, showing an ever-increasing number of countries elevating hostilities against people of faith. Since President Barack Obama took office, several countries he has invested in have also lost freedom. Russia (the “reset button”), Afghanistan (the “real”war), Indonesia (Obama’s boyhood home), and the Palestinian territories—have all been recipients of administration outreach and have all increased in hostility toward religion over the course of President Obama’s tenure. It would be foolish to assert that President Barack Obama is responsible for the rising tide of hostility toward religion, but it is factual to say that the President’s efforts have not helped to make these countries any freer for people of faith. Personally, I wonder whether the hostility toward Christianity in America isn’t spreading to the rest of the world. There was a time when America was a beacon of freedom, calling other nations to a higher standard of liberty. Now, however, America is sliding away from genuine First Amendment freedom. Thus, it is no surprise that others are, too. For the first time since the Pew Forum has been publishing this report, religious hostilities have increased in the U.S. In addition, restrictions against religion continue to increase in the USA. 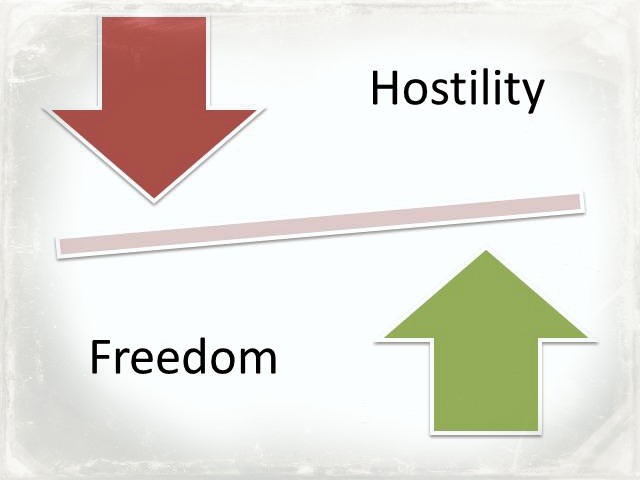 Could it be that restrictions against religion facilitate hostility toward religion? This entry was posted in Christian Living, Persecution, Politics and tagged First Amendment, Freedom of religion, Indonesia, obama, Palestinian territories, Pew Forum, Pew Research Center, rising Tide restriction religion, United States. Bookmark the permalink. Thank you for your effort to help people realize the danger we, as American citizens, are facing. Freedom of religion is a precious thing to take for granted. God bless you and your mission.